The pistol packing pastor, Stephen Grant, is back. The former Navy SEAL and CIA agent turned Lutheran Pastor, continues to care for his flock at St. Mary’s Lutheran Church in Long Island. The Assistant Pastor at St. Mary’s, Zack Charmichael, has every intention of attending a comic convention with his wife Cara, who is a nurse, but as the flu sweeps the hospital staff she has to excuse herself. Grant is the backup, who goes to his first comic con. 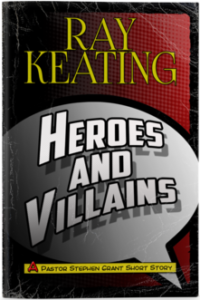 Those who have been to one of these events will appreciate Keating’s description, including the costumes that some wear. Where else than a comic convention would one want to go to fight the forces of evil, and this time Grant teams up with a unique set of heroes to thwart a villainous plot against one of the all-time great comic book writers and artists. As always, the Grant novels are more than just well-written action stories. He also includes thought provoking insights into our world. This short story is no exception. You can sit down and read this in one afternoon. As with all the stories in this series, I give this book my full endorsement. By God’s grace and the power of the Holy Spirit, the family of Our Redeemer will strengthen ourselves spiritually to bring all people into harmony with God and His Son, Jesus Christ.